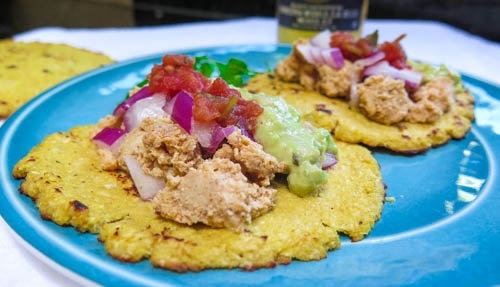 Healthier tortillas packed with delicious Mexican spices! On a cutting board, chop up an entire head of cauliflower into chunks and place into a food processor. Process until rice like consistency. Next, pour riced cauliflower into a microwavable bowl and microwave on HIGH for 2 minutes. Stir, then microwave again for an additional 2 minutes. Set aside until cooled. Working in batches, take the riced cauliflower and place it into the cheesecloth, wring out the excess water. Do this a few times as cauliflower holds a lot of water. Place the wringed out cauliflower into a medium mixing bowl and mix in eggs and seasoning. Preheat oven to 425 degrees. On a PAM sprayed baking sheet take a â…• of the mixture and pat into round disks (should make 5). Bake for 7 minutes until golden. Next, in a large skillet over medium high heat, pour a teaspoon of olive oil and coat the pan. Once hot, place a 2-3 tortillas at a time into the skillet to brown on each side (3 minutes per side). Enjoy with shredded chicken, fresh salsa, and guacamole.